John Cocker married Ann Crisp on 28 Jan 1755 in St James Church, Holme next Runcton, Norfolk, England. They had four children: Martha, Maria, Susanna and John. 2-Martha Cocker was born in 1756 in Norfolk, England and was christened on 27 Apr 1756 in St James Church, Holme next Runcton, Norfolk, England. She was a twin sister to Maria. 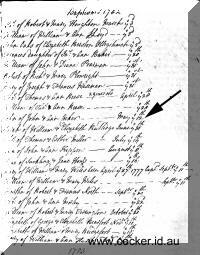 2-Maria Cocker was born in 1756 in Norfolk, England and was christened on 27 Apr 1756 in St James Church, Holme next Runcton, Norfolk, England. 2-Susanna Cocker was born in 1757 in Norfolk, England and was christened on 4 Dec 1757 in St James Church, Holme next Runcton, Norfolk, England. 2-John Cocker was born in 1761 in Holme next Runcton, Norfolk, England and was christened on 19 Apr 1761 in St James Church, Holme next Runcton, Norfolk, England. John married Ann Harrold on 22 Jul 1781 in St Edmunds Church, Downham Market, Cambridgeshire, England. They had a son: John. 3-John Cocker was born in 1782 in Downham Market, Cambridgeshire, England, was christened on 12 May 1782 in St Edmunds Church, Downham Market, Cambridgeshire, England, died in 1826 in Welney, Cambridgeshire, England at age 44, and was buried on 16 Mar 1826 in St Mary the Virgin Church of England, Welney, Norfolk, England. John married Sarah Watson on 27 May 1805 in Welney, Cambridgeshire. Sarah was buried on 6 Oct 1805 in Welney, Cambridgeshire. 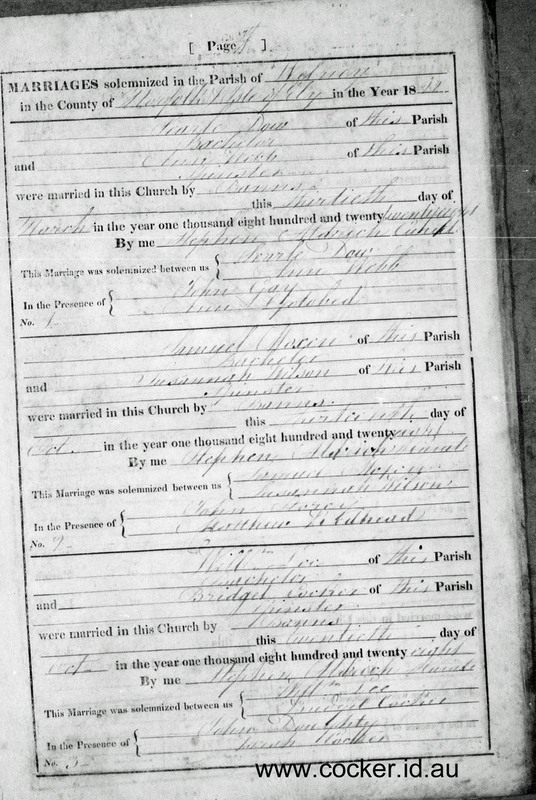 John next married Margaret Norman, nee Burch, on 13 Dec 1807 in Church of All Saints, Church Road, Hilgay, Norfolk, England. Margaret was born about 1770. She married William Norman on 16 Aug 1796 in Welney, Cambridgeshire. John and Margaret had three children: Bridget, Sarah and John. 4-Bridget Cocker. Bridget married William Lee on 20 Oct 1828 in Welney, Cambridgeshire. 4-Sarah Cocker was christened on 15 Jul 1810 in Welney, Cambridgeshire and died in Oct 1897 in Willington, Durham, United Kingdom at age 87. Sarah married George Summers, son of James Summers and Anne Cranness, on 29 Mar 1831 in Welney, Cambridgeshire. George was born about 1811 in Bagthorpe, Norfolk England and died in Jul 1880 in Durham, England aged about 69. They had four children: Mary Ann, William, John Kirkham and Frederick. 5-Mary Ann Summers was born in 1832 in Little Walsingham, Norfolk, England and died on 13 May 1902 in Willington, Durham, England at age 70. Mary married William Wilkin, son of William Wilkin and Ann Fordsmith, on 30 Jun 1851 in Chapel of Bacup, Whalley, Lancashire. William was born in 1829 in Walsingham, Norfolk, England and died in 1899 in Willington, Durham, England at age 70. Another name for William was Wilkinson. They had four children: Sarah, Frances Ann, Margaret and Mary Ann. 6-Sarah Wilkin was born in Oct 1851 in Newchurch, Haslingden, Lancashire, England and died in Mar 1907 in Durham, England at age 55. Sarah married James Bird, son of Joseph Bird and Lettice Collins, in Jul 1870 in Guisborough, Yorkshire North Riding, England. James was born in 1850 in Upwell, Cambridge, England and died in 1907 in Durham, England at age 57. They had six children: Hannah, Lettice, Mary Ann, William Wilkin, James and Joseph. 7-Hannah Bird was born in 1873 in Willington, Durham, England. Hannah married John Thomas Longstaff in Jan 1894 in Durham, England. John was born about 1868 in Willington, Durham, England and died on 14 Aug 1919 in Newcastle upon Tyne, Northumberland, England aged about 51. They had four children: Joseph, James, Hilda and John. 8-Joseph Longstaff was born about 1879 in Willington, Durham, England. 8-James Longstaff was born on 3 Oct 1895 in Willington, Durham, England and died on 8 Jul 1918 in Bagneux British Cemetery, Gezaincourt, France at age 22. He served in the First World War. 8-Hilda Longstaff was born about 1899 in Willington, Durham, England. 8-John Longstaff was born about 1907 in Willington, Durham, England. 7-Lettice Bird was born on 30 Jan 1876 in Willington, Durham, England and died in Sep 1931 in Gateshead, Durham, England at age 55. Lettice married Thomas Jamieson in Jul 1903 in Durham, England. Thomas was born about 1876 in Ryton, Durham, England and died on 22 Aug 1966 in Durham, England aged about 90. They had one son: Henry. 8-Henry Jamieson was born in Jan 1906 in Greenside, Durham, England. 7-Mary Ann Bird was born in Apr 1879 in Willington, Durham, England and died in Dec 1918 in Auckland, Durham, England at age 39. Mary married Luke Daniel Wright in Jan 1907 in Auckland, Durham, England. Luke was born in Oct 1879 in Crook, Durham, England and died in Dec 1918 in Auckland, Durham, England at age 39. They had two children: Sarah Wilkin and Joseph. 8-Sarah Wilkin Wright was born on 15 Nov 1908 in Crook, Durham, England and died in May 1992 in Durham, England at age 83. Sarah married Francis Raine, son of George Raine and Mary Harker, in Dec 1936 in Auckland, Durham, England. Francis was born about 1899 in Crook, Durham, England and died on 4 Mar 1960 in Crook, Durham, England aged about 61. 8-Joseph Wright was born in Jun 1916 in Willington, Durham, England. 7-William Wilkin Bird was born in Jul 1882 in Willington, Durham, England and died in Dec 1960 in Durham, England at age 78. William married Elizabeth Smith. Elizabeth was born about 1883 in Oakenshaw, Durham, England and died in Mar 1945 in Durham, England aged about 62. They had one son: William. 8-William Bird was born in 1904 in Oakenshaw, Durham, England. 7-James Bird was born about 1885 in Willington, Durham, England and died on 18 Nov 1915 in Gallipoli, Turkey aged about 30. He served in the First World War. James married Isabell Wilkinson in Oct 1907 in Durham, England. Isabell was born about 1890 in Willington, Durham, England. They had one daughter: Hilda. 8-Hilda Bird was born on 24 Oct 1910 in Willington, Durham, England and died in 2000 in Leeds, Yorkshire, England at age 90. Hilda married Sydney Johnson. Sydney was born in 1909 in Cornsay, Durham, England and died in 1963 in Leeds, Yorkshire, England at age 54. 7-Joseph Bird was born about 1894 in Willington, Durham, England and died on 11 Jun 1959 in Durham, England aged about 65. He served in the First World War. Joseph married Annie May Featherstone in Mar 1917 in Gateshead, Durham, England. Annie was born on 25 Jun 1892 in Crawcrook, Durham, England and died in Jul 1987 in Durham, England at age 95. They had two children: Rhoda and Cyril Arthur. 8-Rhoda Bird was born on 1 Jun 1917 in Gateshead, Durham, England. 8-Cyril Arthur Bird was born in Sep 1924 in Gateshead, Durham, England and died in Feb 1990 in Northumberland, England at age 65. 6-Frances Ann Wilkin was born in Oct 1856 in Willington, Durham, England and died on 13 Apr 1939 in 5 Springfield Terrace, Willington, Durham, England at age 82. 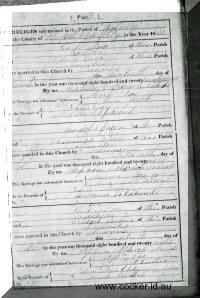 Frances married John William Anderson on 6 Oct 1873 in St Stephens Church, Willington, Durham, England. John was born on 25 Jan 1854 in Bishop Auckland, Durham, England and died in Sep 1926 in Willington, Durham, England at age 72. They had 11 children: William, George, Arthur, Mary Annie, Sarah, James, Florence May, John, Emily, Louisa and Ethel. 7-William Anderson was born in 1878 in Willington, Durham, England and died in Jun 1935 in Durham, England at age 57. 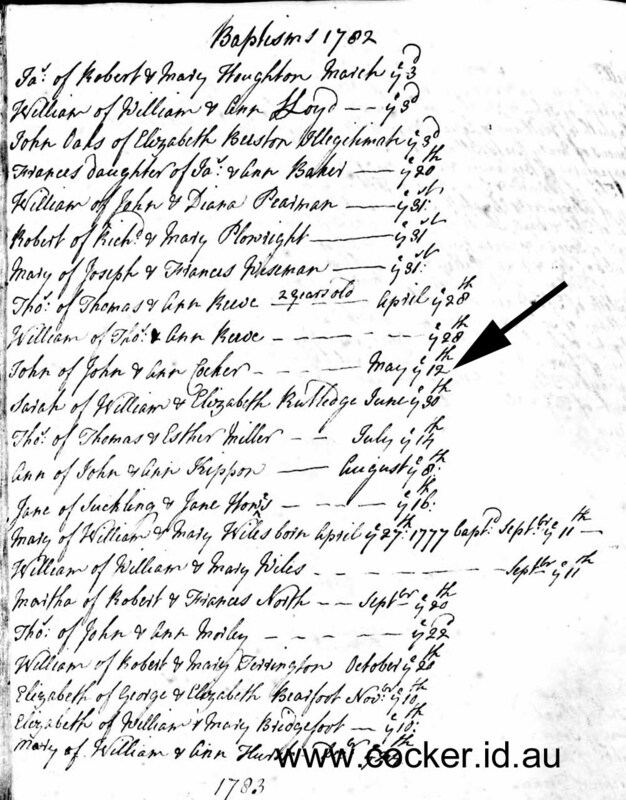 William married Elizabeth Ann Thornton. Elizabeth was born about 1880 in Sunnybrow, Durham, England. They had six children: Hilda, Alfred, Walter, William, Cecil and Mary Ann. 8-Hilda Anderson was born about 1900 in Sunnybrow, Durham, England. 8-Alfred Anderson was born about 1902 in Auckland, Durham, England. 8-Walter Anderson was born about 1904 in Auckland, Durham, England. Walter married Cecilia Nee. Cecilia was born in 1907 in Gateshead, Durham, England. They had two children: Irene and Normans. 9-Irene Anderson was born in 1927 in Auckland, Durham, England and died in 2002 at age 75. 9-Normans Anderson was born in 1931 and died in 1964 at age 33. 8-William Anderson was born about 1906 in Auckland, Durham, England. 8-Cecil Anderson was born about 1908 in Auckland, Durham, England. 8-Mary Ann Anderson was born about 1909 in Durham, England. 7-George Anderson was born about 1880 in Willington, Durham, England. 7-Arthur Anderson was born about 1883 in Willington, Durham, England. Arthur married Ellen Jane Clarke. Ellen was born about 1879 in Langley, Norfolk, England. They had one son: Arthur Edward. 8-Arthur Edward Anderson was born about 1906. 7-Mary Annie Anderson was born about 1885 in Willington, Durham, England. 7-Sarah Anderson was born about 1887 in Willington, Durham, England. 7-James Anderson was born about 1889 in Willington, Durham, England. 7-Florence May Anderson was born on 1 May 1891 in Willington, Durham, England. Florence married Thomas Elliott in Apr 1914 in Durham, England. Thomas was born about 1886 in Durham, England and died in Sep 1963 in Eastbourne, Sussex, England aged about 77. They had one daughter: Dorothy. 8-Dorothy Elliott was born on 30 Apr 1915 in Durham, England and died in Jan 1997 in Eastbourne, Sussex, England at age 81. Dorothy married Norman Bond. Norman was born in 1908 in Willington, Durham, England and died in 1958 in Durham, England at age 50. 7-John Anderson was born about 1893 in Willington, Durham, England. 7-Emily Anderson was born on 14 Nov 1895 in Willington, Durham, England and died in Jun 1977 in Willington, Durham, England at age 81. Emily married James Naisbit Purvis in 1919 in Durham, England. James was born on 18 Mar 1898 in Durham, England and died in Dec 1983 in Durham, England at age 85. They had one son: Sidney. 8-Sidney Anderson was born on 27 Feb 1921 in Durham, England and died on 14 Nov 1980 in Crook, Durham, England at age 59. 7-Louisa Anderson was born about 1899 in Willington, Durham, England. 7-Ethel Anderson was born about 1905 in Willington, Durham, England and died in 2007 in Durham, England aged about 102. Ethel married John Joseph Walker. John was born about 1890 in Sunnybrow, Durham, England and died in Dec 1966 in Durham, England aged about 76. 6-Margaret Wilkin was born about 1859 in Brancepeth, Durham, England and died in Mar 1941 in Durham, England aged about 82. Margaret married Thomas Pescod Johnston, son of James Johnston and Ann Pescod, in 1878 in Durham, England. Thomas was born about 1853 in Willington, Durham, England and died in Jan 1883 in Durham, England aged about 30. They had two children: James and Tom Wilkin. 7-James Johnston was born in 1878 in Williamsford, Tasmania. James married Annie Coxon on 1 Oct 1904 in Pontypridd, Glamorgan, Wales. Annie was born about 1885 in Durham, England and died in Dec 1964 in Sunderland, Durham, England aged about 79. They had three children: John Alexander, William Robert and Leslie James. 8-John Alexander Johnston was born on 22 Jun 1905 in Pontypridd, Glamorgan, Wales. 8-William Robert Johnston was born on 1 Jan 1908 in Pontypridd, Glamorgan, Wales. 8-Leslie James Johnston was born on 8 May 1913 in Aberdeen, Scotland and died in Nov 1966 in Sunderland, Durham, England at age 53. 7-Tom Wilkin Johnston was born in 1882 in Willington, Durham, England and died in Dec 1958 in Sunderland, Durham, England at age 76. Tom married Elizabeth Ann Carroll, daughter of John Carroll and Margaret Jane Wilson. Elizabeth was born about 1879 in Hedley Hope, Durham, England. Margaret next married John Foggin in 1890 in Auckland, Durham, England. John was born about 1852 in East Harlsey, Yorkshire, England. They had two children: Maggie Edna and William. 7-Maggie Edna Foggin was born on 15 May 1901 in Newfield, Durham, England and died in May 1990 in Eastbourne, England at age 89. 7-William Foggin was born on 20 May 1983 in Newfield, Durham, England and died in Mar 1973 in Durham, England at age -11. William married Emily Blackburn. 6-Mary Ann Wilkin was born in Feb 1862 in Willington, Durham, England and died in Willington, Durham, England. Mary married John Taylor, son of Robert Taylor and Maria Moore, on 20 May 1880. John was born in 1857 in Yaxley, Suffolk, England and died in 1933 in Willington, Durham, England at age 76. They had ten children: John, Maria, Phylis, James, Walter, Florence, Amy, Isabel, Harry and Agnes. 7-John Taylor was born about 1881 in Willington, Durham, England. John married Catherine Elliott. Catherine was born about 1884 in Willington, Durham, England. They had one daughter: Isabel. 8-Isabel Taylor was born about 1908 in Willington, Durham, England. 7-Maria Taylor was born about 1882 in Willington, Durham, England and died in Aug 1950 in Durham, England aged about 68. Maria married James Smart Sewell. James was born in Jan 1879 in Waldridge Fell, Durham, England and died in Dec 1964 in Durham, England at age 85. They had one son: Joseph. 8-Joseph Sewell was born in Apr 1906 in Durham, England. Joseph married Jane Williams. 7-Phylis Taylor was born in 1886 in Willington, Durham, England and died in Jun 1955 in Warwick, Warwickshire, England at age 69. Phylis married Sydney Charles Fulwood Vincent. Sydney was born about 1880 in Flushing, Cornwall, England and died on 19 Apr 1957 in Royal Leamington Spa, Warwickshire, England aged about 77. They had two children: Dorothy Ann and Jack Leonard. 8-Dorothy Ann Vincent was born in Mar 1907 in Durham, England. Dorothy married Arnold Lithgo. 8-Jack Leonard Vincent was born in Oct 1908 in Durham, England and died in 1970 in Manly, Sydney, New South Wales at age 62. Jack married Muriel Grace Morris in 1936 in Moss Vale, New South Wales. Muriel was born in 1910 in Goulburn, New South Wales and died in 1979 in New South Wales at age 69. 7-James Taylor was born in 1888 in Willington, Durham, England. 7-Walter Taylor was born about 1890 in Willington, Durham, England. 7-Florence Taylor was born on 7 Mar 1894 in Willington, Durham, England and died on 8 Jul 1978 in Willington, Durham, England at age 84. Florence married Anthony Rosethorne, son of William Rosethorne and Elizabeth Ovington, in Jan 1914 in Durham, England. Anthony was born on 25 Nov 1891 in Oakenshaw, Durham, England and died on 20 Jun 1966 in Oakenshaw, Durham, England at age 74. Her served in the First World War. They had two children: Alfred and Lewis. 8-Alfred Rosethorne was born on 26 Jun 1914 in Oakenshaw, Durham, England and died on 15 Oct 1999 in Perth, Western Australia at age 85. Alfred married Margaret Walls, daughter of Albert Edward Walls and Isabella Jane Rowell, in Jul 1941 in Coventry, Warwickshire, England. Margaret was born on 6 Nov 1919 in Annfield Plain, Durham, England and died on 31 Dec 1981 in Coventry, Warwickshire, England at age 62. They had one son: Alfred. 9-Alfred Rosethorne was born on 1 Sep 1948 in Coventry, Warwickshire, England. Alfred married Barbara Carol Turner on 23 Oct 1971 in Coventry, Warwickshire, England. Barbara was born on 6 Jun 1952 in Coventry, Warwickshire, England. 8-Lewis Rosethorne was born in 1920 in Oakenshaw, Durham, England and died on 15 Oct 2007 in Blackpool, Lancashire, England at age 87. 7-Amy Taylor was born about 1899 in Willington, Durham, England and died in 1906 in Willington, Durham, England aged about 7. 7-Isabel Taylor was born on 25 Aug 1901 in Willington, Durham, England and was christened in Mar 1933 in Durham, England. Isabel married James Pearson. James was born about 1899 in Willington, Durham, England and died in Mar 1969 in Durham, England aged about 70. They had one son: John. 8-John Pearson was born in 1927 in Durham, England. 7-Harry Taylor was born in Jan 1903 in Willington, Durham, England. 7-Agnes Taylor was born in Jan 1906 in Willington, Durham, England. Agnes married Cecil Hunter. Cecil was born about 1905 in Oakenshaw, Durham, England. 5-William Summers was born on 11 Jun 1837 in Newchurch in Rossendale, Lancashire and died in Jun 1917 in Sedgefield, Durham, England at age 80. William married Ann Walker. Ann was born about 1837 in Lindley, Yorkshire, England and died about Aug 1906 in Durham, England aged about 69. They had seven children: Emma, George, William, Frederick Johnson, John, Sarah Ann and Phoeby. 6-Emma Summers was born about 1861 in Willington, Durham, England and died in Oct 1887 in Willington, Durham, England aged about 26. Emma married Joseph Blackburn, son of Joseph Blackburn and Dinah, in 1878 in Durham, England. Joseph was born about 1860 in Brandon, Durham, England. They had one daughter: Annie. 7-Annie Blackburn was born in 1881 in Willington, Durham, England. Annie married Isaac William Venn. Isaac was born in 1881 in Bishop Auckland, Durham, England. They had one son: Joseph. 8-Joseph Venn was born in 1906 in Willington, Durham, England. 6-George Summers was born about 1863 in Willington, Durham, England. In the 1881 Census he was a coal miner living at home,18 Albert Street, aged 17. 6-William Summers was born about 1865 in Willington, Durham, England. William married Annie about 1891. Annie was born about 1867. They had two children: Annie and Emma. 7-Annie Summers was born about 1893 and died in Dec 1976 in Willington, Durham, England aged about 83. Annie married Zephaniah Hickman in Mar 1917 in Durham, England. Zephaniah was born in Oct 1893 in Spennymoor, Durham, Engalnd and died in Mar 1941 in Willington, Durham, England at age 47. They had one son: William. He served in the First World War. 8-William Hickman was born on 17 Apr 1921 in Willington, Durham, England and died in May 2003 in Northampton, England at age 82. William married Irene Wise, daughter of Edward John Wise and Maria Underhill, in Jun 1945 in Birmingham, England. Irene was born on 12 Aug 1922 in Aston, Warwickshire, England and died in Jun 1979 in Birmingham, England at age 56. 7-Emma Summers was born in Jan 1905 in Willington, Durham, England. 6-Frederick Johnson Summers was born about 1867 in Willington, Durham, England. 6-John Summers was born about 1870 in Willington, Durham, England and died in Jun 1956 in Durham, England aged about 86. John married Catherine Parkin, daughter of Thomas Parkin and Ann, in Oct 1894 in Durham, England. Catherine was born about 1873 in Willington, Durham, England and died in Sep 1953 in Durham, England aged about 80. They had seven children: Annie, George William, Jane Edith, Catherine, Emma, Thomas and James. 7-Annie Summers was born about 1895 in Willington, Durham, England. 7-George William Summers was born in Apr 1897 in Willington, Durham, England and died in Jun 1965 in Durham, England at age 68. 7-Jane Edith Summers was born about 1899 in Willington, Durham, England. 7-Catherine Summers was born about 1901 in Willington, Durham, England. 7-Emma Summers was born about 1903. 7-Thomas Summers was born about 1907 in Willington, Durham, England. 7-James Summers was born about 1908. 6-Sarah Ann Summers was born about 1873 in Willington, Durham, England. Sarah married Thomas Pearson. Thomas was born about 1868 in Willington, Durham, England. They had two children: Emma and Thomas. 7-Emma Pearson was born in 1891 and died in 1891. 7-Thomas Pearson was born about 1895. 6-Phoeby Summers was born about 1875 in Willington, Durham, England. 5-John Kirkham Summers was born on 4 Mar 1843 in Soham, Cambridgeshire, England and was christened on 26 Mar 1843 in Welney, Cambridgeshire. John married Mary Ann Wilson, daughter of William Hodgson Wilson and Elizabeth, in Jul 1863 in St Stephens Church, Willington, Durham, England. Mary was born about 1847 in Brancepeth, Durham, England. They had 13 children: William, Harriett, Elizabeth A., Sarah Ada, John Andrew, Joseph, George, Charles, Lily, Herbert, Robert, Archibald and Florence Emily. 6-William Summers was born about 1864 in Willington, Durham, United Kingdom. 6-Harriett Summers was born about 1866 in Willington, Durham, United Kingdom. 6-Elizabeth A. Summers was born about 1868 in Middleton, Yorkshire, United Kingdom. 6-Sarah Ada Summers was born about 1870 in Gateshead, Durham, England. 6-John Andrew Summers was born in 1872 in Willington, Durham, United Kingdom and died in 1949 in Worksop, Nottinghamshire, England at age 77. John married Rebecca Wigham. Rebecca was born in Mar 1877 in Boyne, Durham, England and died in Oct 1949 in Worksop, Nottinghamshire, England at age 72. They had one daughter: Violet. 7-Violet Summers was born on 11 Dec 1919 in Worksop, Nottinghamshire, England and died in Dec 2001 in Worksop, Nottinghamshire, England at age 82. Violet married Herbert Somers in Sep 1938 in Worksop, Nottinghamshire, England. Herbert was born on 19 Mar 1913 in Prestwick, Northumberland, England and died in Oct 1995 in Worksop, Nottingamshire, England at age 82. He served in the Second World War. 6-Joseph Summers was born in 1874. 6-George Summers was born about 1876 in Thornley, Durham, England. 6-Charles Summers was born in 1878 in Pemberton, Lancashire, England. 6-Lily Summers was born about 1880 in Pemberton, Lancashire, England. 6-Herbert Summers was born about 1882 in Pemberton, Lancashire, England. 6-Robert Summers was born about 1883 in Pemberton, Lancashire, England. 6-Archibald Summers was born about 1885 in Pemberton, Lancashire, England. 6-Florence Emily Summers was born about 1888 in Pemberton, Lancashire, England. 5-Frederick Summers was born about 1848 in Welney, Cambridgeshire, (now Norfolk) England and died in Mar 1921 in Lancaster, Durham, England aged about 73. Frederick married Margaret Pennington in 1867. Margaret was born about 1844 in Kendall, Westmorland, England and died in Jun 1925 in Lancaster, Durham, England aged about 81. They had eight children: Sarah, Frederick, Thomas Henry, John, Ester, Joseph Robert, Hannah Maria and James. 6-Sarah Summers was born about 1869 in Willington, Durham, England. 6-Frederick Summers was born about 1871 in Willington, Durham, England. 6-Thomas Henry Summers was born about 1873 in Willington, Durham, England. Thomas married Hannah Brown. Hannah was born about 1876 in Close House, Durham, England. They had three children: Margaret, Gladys and Thomas Henry. 7-Margaret Summers was born about 1897 in Craghead, Durham, England. 7-Gladys Summers was born about 1902 in Wheatley Hill, Durham, England. 7-Thomas Henry Summers was born about 1907 in Wheatley Hill, Durham, England. 6-John Summers was born about 1875 in Willington, Durham, England. John married Mary E. Stewart. Mary was born about 1879 in Eldon lane, Durham, England. They had three children: Sarah, Jane and Doris Mary. 7-Sarah Summers was born about 1899 in Wolsingham, Durham, England. 7-Jane Summers was born about 1902 in Wolsingham, Durham, England. 7-Doris Mary Summers was born about 1906. 6-Ester Summers was born about 1877 in Willington, Durham, England. 6-Joseph Robert Summers was born about 1879 in Newfield, Durham, England. Joseph married Hannah Elizabeth. Hannah was born about 1183 in Morley Farm, Shitlopeside, England. They had four children: Frances Margaret, Edith Mary, Phoebe Annie and Thomas Henry. 7-Frances Margaret Summers was born about 1905 in Frosterley, Durham, England. 7-Edith Mary Summers was born about 1907 in Wolsingham, Durham, England. 7-Phoebe Annie Summers was born about 1908 in Frosterley, Durham, England. 7-Thomas Henry Summers was born about 1910 in Frosterley, Durham, England. 6-Hannah Maria Summers was born about 1884 in Willington, Durham, England. Hannah married Daniel Carrol. Daniel was born about 1884. 6-James Summers was born about 1887 in Willington, Durham, England. 4-John Cocker was born about Sep 1812 in Welney, Cambridgeshire, (now Norfolk) England, was christened on 19 Aug 1813 in Welney Church of England Chapel, Cambridgeshire, England, died on 10 Feb 1872 in Evandale, Tasmania aged about 59, and was buried in Uniting Church Cemetery, Evandale, Tasmania. John married Sarah Elizabeth Briggs, daughter of Isaac Briggs and Alice Dean, on 22 Aug 1845 in Green Ponds, now Kempton, Tasmania. Sarah was born on 28 Jul 1828 in Norland, Halifax, Yorkshire, England, was christened on 15 Nov 1831 in Norland, Halifax, Yorkshire, England, and died on 30 Aug 1874 in Barrington, Tasmania at age 46. They had 11 children: John, Sarah, Joseph, Louisa, Margaret Alice, William Alfred, George Samuel, Albert, James, Charles Robert Arthur and Jane Evangeline.